This Coconut Vegan Panna Cotta is dairy free as it uses coconut milk and vegetarian as the seaweed agar agar is used for setting. Full fat coconut milk is used for a creamy vanilla panna cotta. If you don’t like coconut milk use any other plant-based milk such as hemp, oat, almond or soy. Add two tablespoons of coconut oil or coconut butter if you’re not using coconut milk for a creamy dessert. 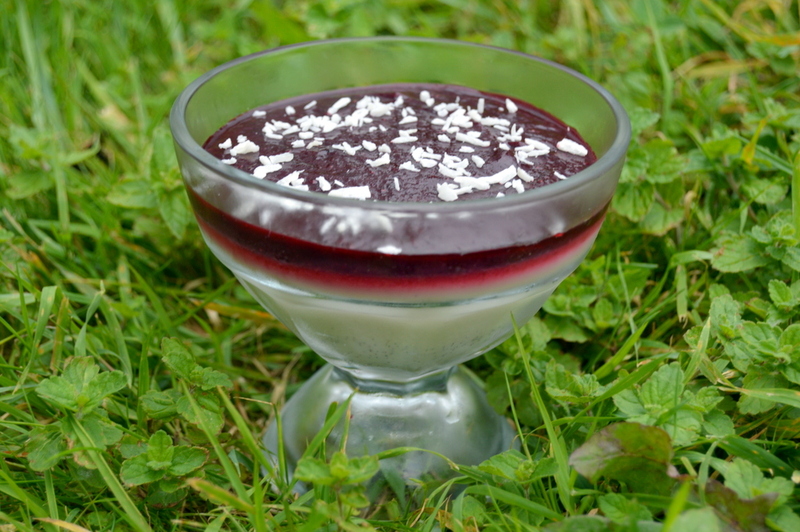 Normal panna cotta is made with the animal bone product gelatine. Even if you aren’t vegan a sniff of gelatine boiling will make you want to use seaweed instead! For the imagery on this page I used blackcurrants for the berry compote. These work well as have a sharp tart taste that is delicious with the smooth and creamy coconut. 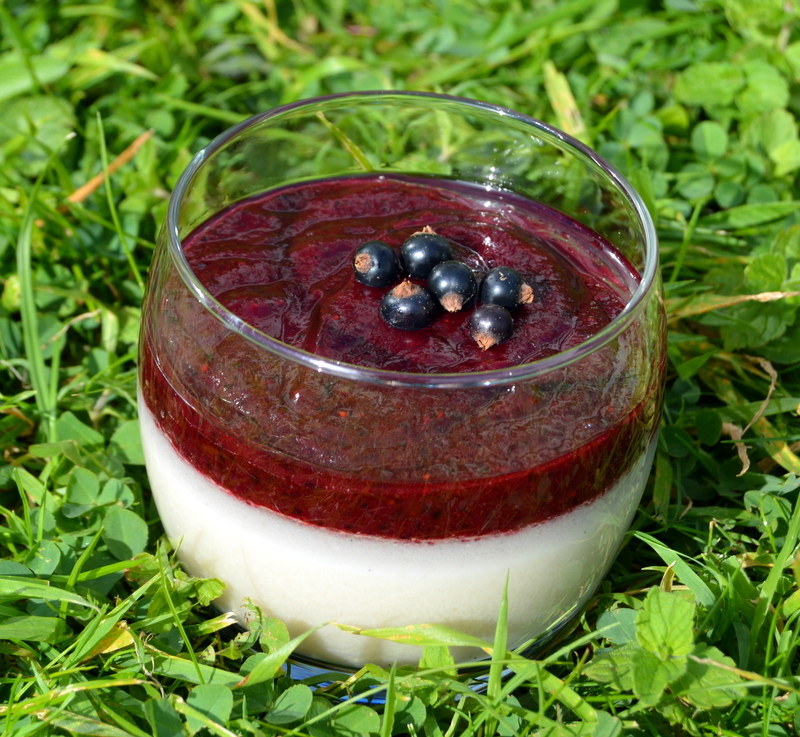 However any berry can be used for this panna cotta such as blackberries, blueberries, raspberries or strawberries. You may need to adjust the amount of lemon juice and dates depending on the sweetness of the fruit. I often serve this in a mixture of old recycled jars of varying sizes and shapes. It avoids any fiddly turning out onto a serving dish and looks very presentable. This panna cotta is great if you’re making it just for yourself as you have individual servings and will last for several days in the fridge. This vegan panna cotta recipe is not strictly raw as the agar agar is heated to set it, but most raw foodists would forgive this. Swap the milk for a type of raw milk (cashews blended works very well) and allow the agar agar to cool a bit before adding and you will have a raw vanilla vegan Panna Cotta. Panna Cotta is Italian for cooked cream. Coconut milk is nice and thick so works well for this recipe. Some people can get so offended with vegan foods using traditional names but the taste and look is the same so I feel perfectly justified calling this vegan Panna Cotta. Bring to the boil 1 cup / 240ml of water then stir in the agar agar. Reduce to a simmer and stir constantly for 5 minutes, making sure no agar agar gets stuck to the bottom. Take off the heat and add the coconut milk, vanilla and maple syrup. Wisk to ensure all the coconut fat is melted. Pour into dishes, leave to cool then move to the fridge to set. It only needs to cool to set (30 minutes or so). Blend together the berries, dates, lemon juice with a few tablespoons of water. Pour the berry compote over the top of the now set panna cottas. 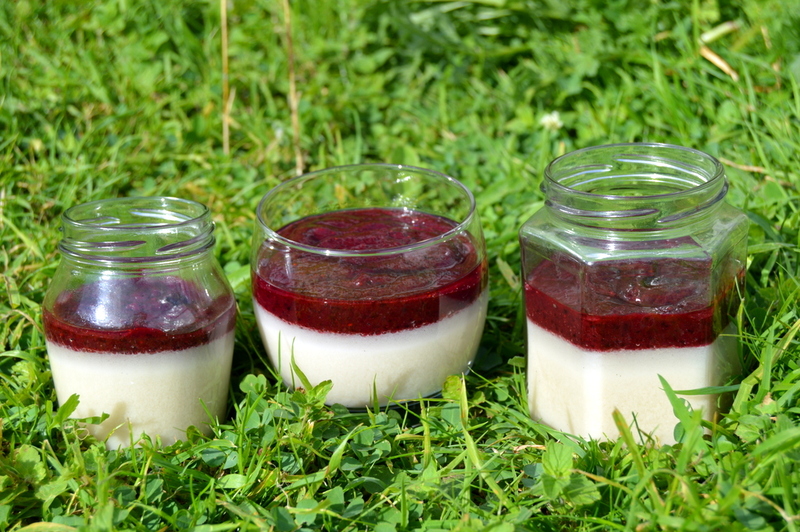 The dairy-free panna cotta is ready to eat or keep in the fridge where it will last several days. The berry compote makes a great ice cream sauce. This ratio is inedible. Maybe it is that agar is different strengths, but I would agree with the previous comment. Too bad I wasted good coconut milk. I’m sorry to hear that. But no need to waste anything – just remelt with some extra water or coconut milk.